Our 2018/19 catalog Bellissima is now available to download. Bellissima is a lyrical Italian word meaning the most beautiful woman. 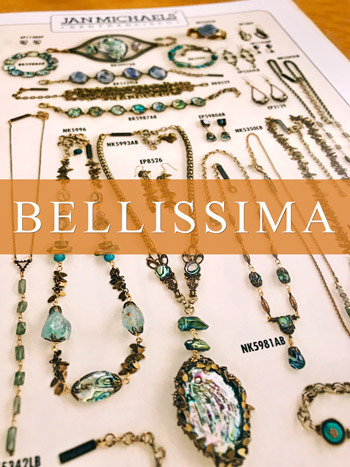 With Bellissima as this year's catalog title, we both celebrate and encourage all women around the world to express the fullness of their creativity, femininity & strength. By realizing our passions and dreams, we will continue to shift imbalances in the workplace and beyond. Please allow 1 to 2 minutes for the catalog to fully load, and for optimal viewing, use Adobe Acrobat Reader. Note that our online store offers a subset of the jewelry that is available in Bellissima. If you’d like to purchase an item that is not available online, please call us at 1.800.971.7717 anytime Monday through Friday from 10:30 AM to 6:30 PM PST. If you are a wholesale customer, please sign into our online wholesale store to view the wholesale catalog.